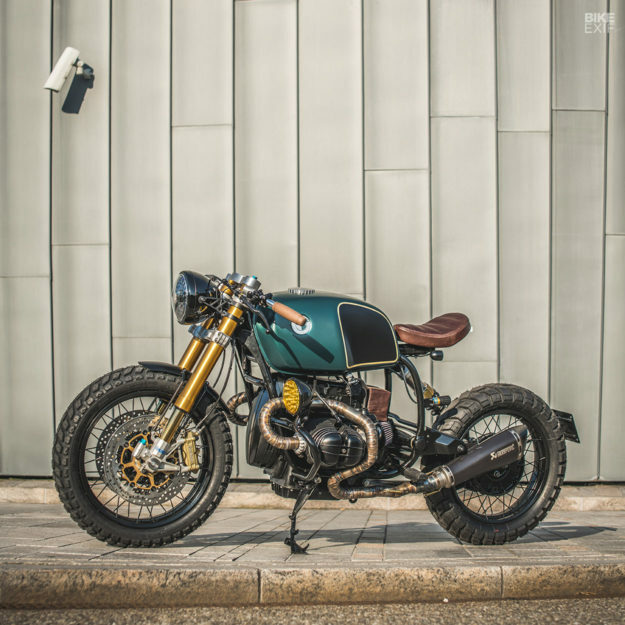 If you’re unsure whether classic BMW airheads are still popular custom donors, just ask Ironwood Custom Motorcycles. 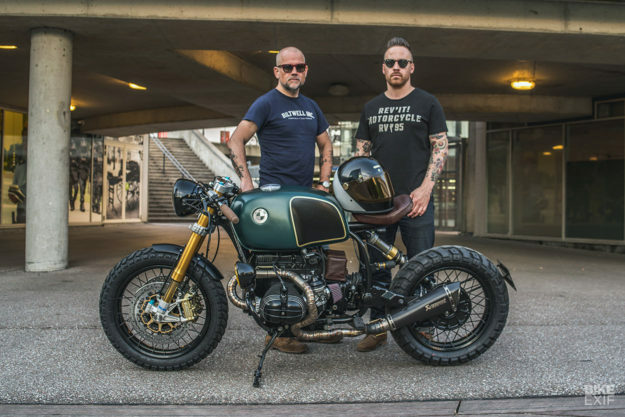 The Dutch outfit has been going since 2012, but hit top gear a couple of years ago—and have racked up almost a dozen Beemer commissions to meet demand. 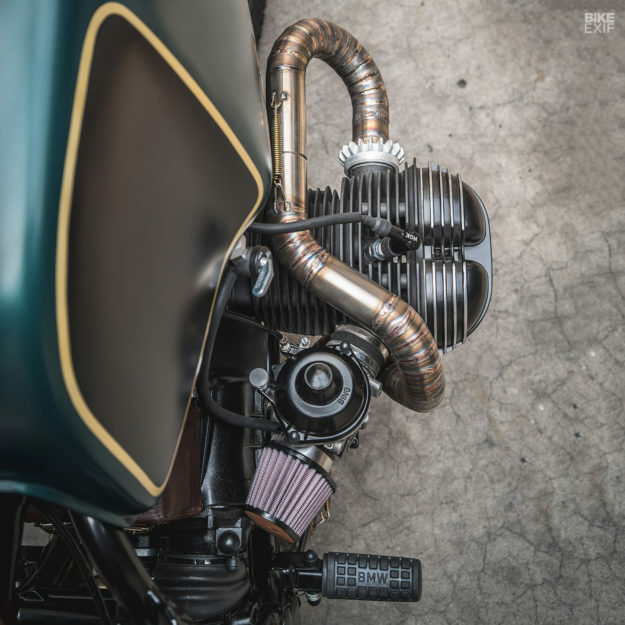 Many of these builds are based on their blacked-out ‘Death Star’ style, but they’ve also created extreme one-offs like ‘The Mutant‘—one of the most popular bikes ever shown on EXIF. 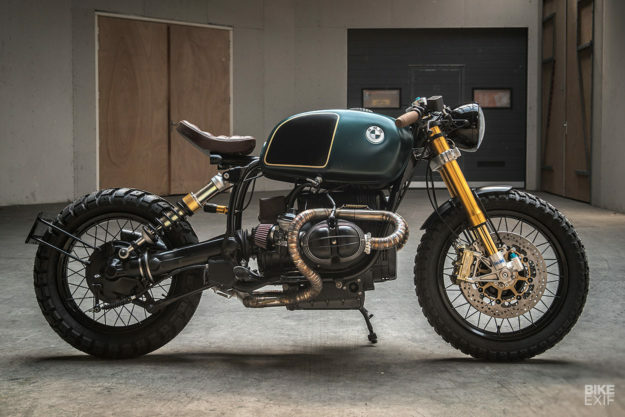 So with their latest BMW-based project, Ironwood decided to build something in-between. 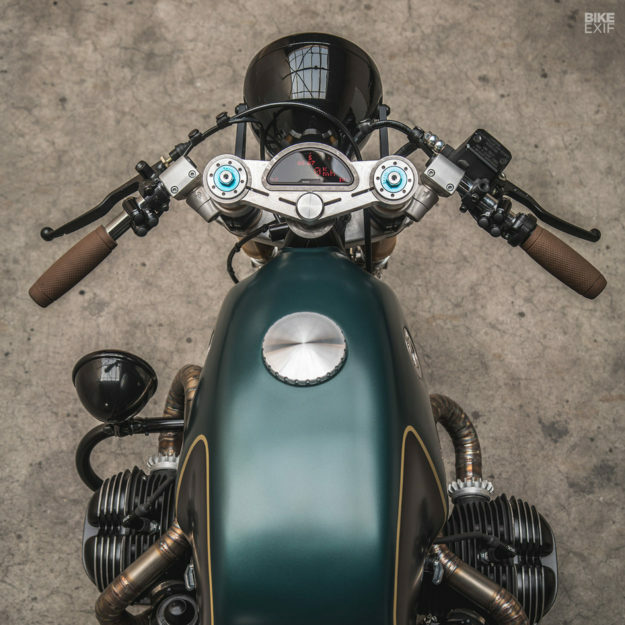 Meet ‘The Moon Crawler’—an unconventional BMW R100R that blends the bobber vibe of Ironwood’s Death Star builds, with a little of The Mutant’s modern café racer aggression. The combination of clip-ons, a bobbed seat and semi-knobblies might have some readers scratching their heads. But on the up side, this is one sorted Beemer. Head wrench Eric Kalter, and the rest of the Ironwood team, started with a pristine donor—but tore it down to the ground anyway. They gave the motor a refresh with new gaskets and seals, then painted and powder coated various bits to get it looking new. The subframe went in the bin, and the rest of the frame was cleaned up and sent for a fresh coat. 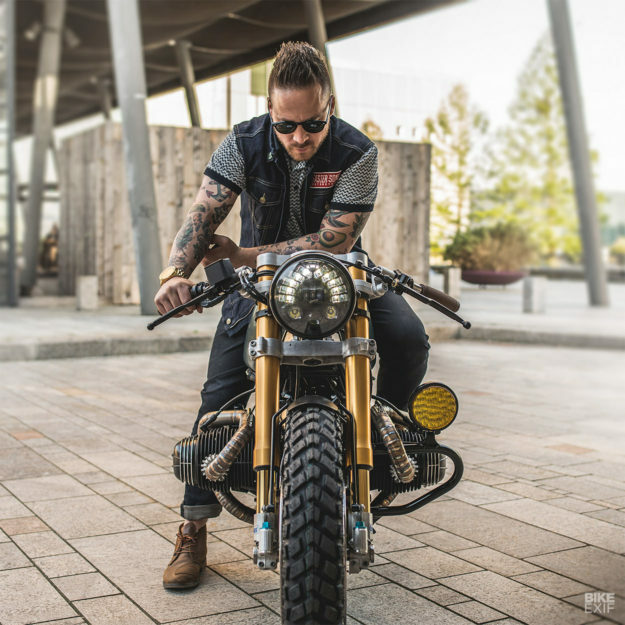 There’s a basic bobber-style seat mounted directly to the frame. It’s been upholstered by Marcel Miller at Miller Kustom Upholstery, who also whipped up a matching battery box. The box sits where the airbox once did, so the motor now breathes through a pair of cone filters. Building a svelte rear end meant clearing out the electronics. 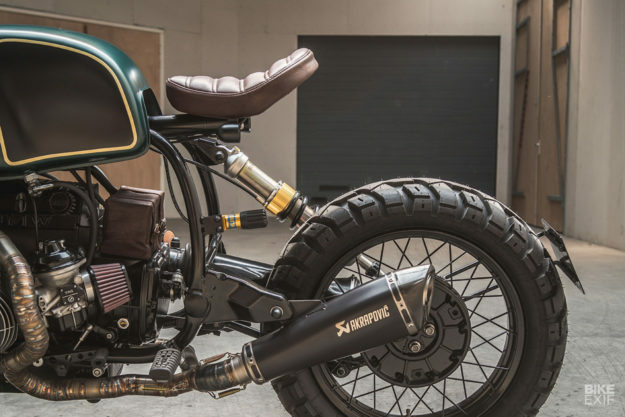 So Ironwood rewired the Beemer around a Motogadget control unit and a Lithium-ion battery, and built in an RFID ignition. The receiver sits up front, mounted to a beautifully machined aluminum top triple clamp that also holds a digital Motogadget dash. The cockpit also features Tarozzi clip-ons, new grips, and switchgear from Motone. The headlight’s a full LED unit, with integrated turn signals, and there’s a second light lower down, mounted on the left engine crash bar. Twin LEDs under the seat handle taillight and turn signal duties, with a custom-built license plate holder to keep the fuzz at bay. There are some mean chassis upgrades too. 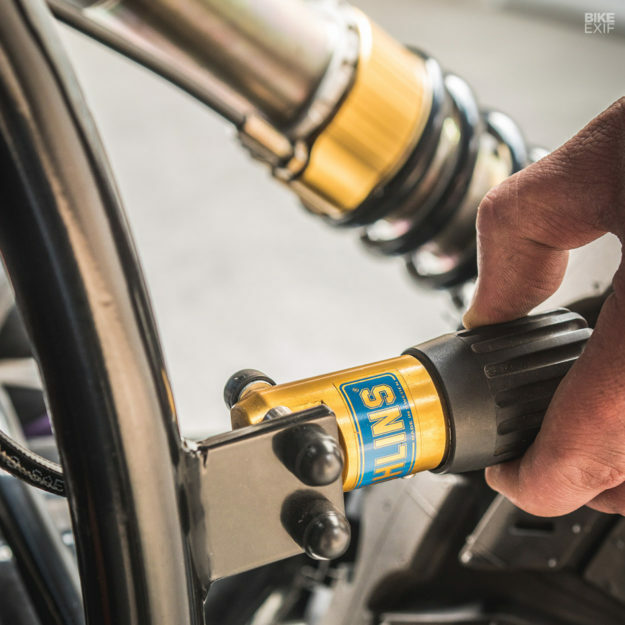 “Since the moon surface is dusty and soft, with deep craters,” Arjan jokes, “the Moon Crawler is equipped with rugged shocks from Öhlins so it can maneuver like a spider.” We love the trick placement of the rear shock’s remote reservoir. The front brake setup is now all-Brembo. And the tires have been switched out to dual-sport Heidenau K60 Scouts (18” up front, and 17” at the back). 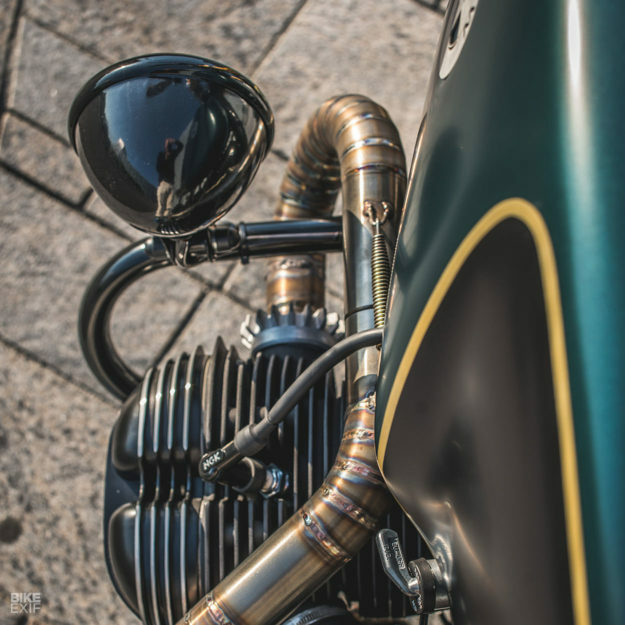 Resident welder Mervin Wagner put the headers together, terminating the system in an Akrapovič muffler made for the BMW R nineT. “It provides the right type of roar,” says Arjan. 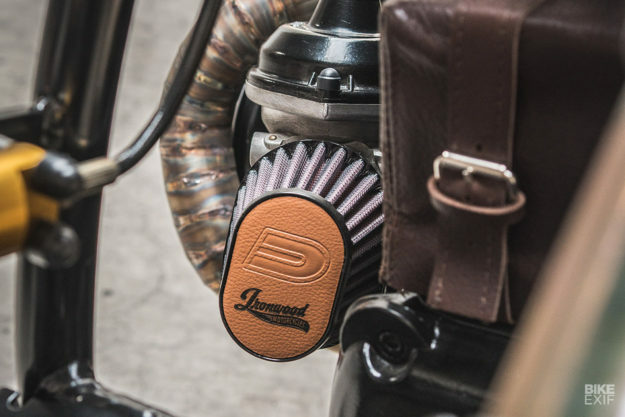 The Moon Crawler’s finished with one-off pieces like the front fender, billet gas cap, and laser-cut tank emblems. The final paint scheme is subtle and tasteful, with just the right amount of gold to set off the Öhlins bits. It’s an interesting mash-up of styles, but it’s paid off. If Ironwood keep this up, their order book is going to be full for a while longer.